Burning leftover liquid fuel in its propellant tanks, the Falcon 9 rocket’s first stage will fly back to Earth after finishing a nearly three-minute burn to send SpaceX’s Dragon commercial cargo craft toward the space station. The descent of the first stage will occur just as the Falcon 9’s single-engine upper stage puts the Dragon supply ship into orbit on course for a resupply run to the six-person space station crew. Friday’s launch is scheduled for 1:22 p.m. EST (1822 GMT), roughly the moment the International Space Station’s orbital track passes over Cape Canaveral. The 14-story rocket booster will plunge back through the atmosphere at hypersonic speed, firing a subset of its nine Merlin 1D engines three times to a controlled vertical landing on a barge positioned about 200 miles northeast of the Falcon 9’s launch pad at Cape Canaveral. Other rockets are designed to be expendable and are destroyed during their fall back to Earth. Nothing like it has ever been tried before. Rocket engineers from several companies — including SpaceX’s rocket team — have flown vertical takeoff and landing testbeds on short hops, and the space shuttle’s solid rocket boosters parachuted to Earth for retrieval by ships in the Atlantic Ocean. SpaceX has also flown Falcon 9 boosters to two successful soft water landings in the Atlantic after space launches in April and July. What SpaceX is trying on Friday’s launch is more dicey, and company officials are circumspect when talking about probability of pulling off the feat on the first attempt. “It’s probably not more than a 50 percent chance or less of landing it on the platform for the first time,” said Elon Musk, SpaceX’s CEO and chief technology officer, in remarks at a colloquium held in October at the Massachusetts Institute of Technology. In the long run, Musk says reusing rockets is vital to expanding access to space. He likes SpaceX’s chances of achieving an intact landing of a rocket within the next year. After attempts to recover Falcon rockets by parachute failed, SpaceX turned to a propulsive landing concept in which the booster’s first stage engines would refire several times in flight to guide the rocket to controlled touchdown. SpaceX engineers have fine-tuned the descent system’s design over the last year. The first try to land a Falcon 9 rocket stage after a September 2013 launch from Vandenberg Air Force Base in California succumbed to a high roll rate that starved its engines of fuel due to centrifugal forces. Engineers added more powerful nitrogen cold gas thrusters to stabilize the rocket’s roll during descent during the next attempt in April, which accomplished a gentle splashdown in the Atlantic Ocean before it crashed on its side and disintegrated. The next full-up landing test in July — after a launch with six Orbcomm communications satellites — had a similar result. SpaceX eventually eyes flying its rocket boosters back to their launch sites to permit rapid reuse, but the company indicated in mid-2014 it might try landing a rocket on an ocean-going barge by the end of the year. 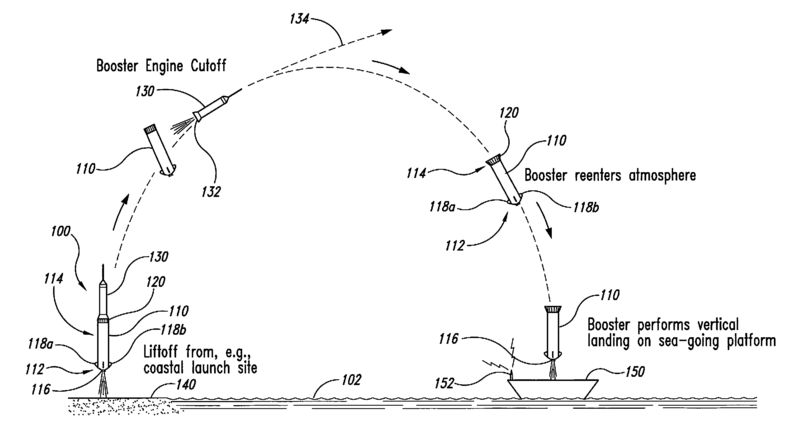 In August, SpaceX filed challenges to a patent granted to Blue Origin, a space industry competitor owned by Amazon.com founder Jeff Bezos, describing a concept to land a rocket tail first on an ocean vessel after launching from a shore-based facility. 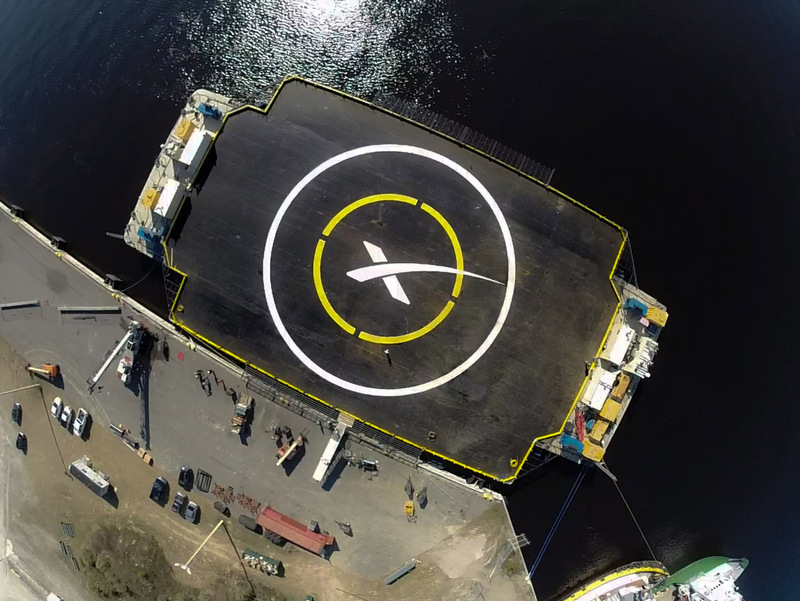 SpaceX cited previous design work involving sea-based rocket landing pads before Blue Origin applied for the patent in 2009. “The ‘rocket science’ claimed in the ‘321 patent was, at best, ‘old hat’ by 2009,” SpaceX attorneys wrote in one of the patent challenge petitions. While SpaceX is on the verge of attempting a barge landing, Blue Origin has not disclosed any near-term plans to demonstrate the concept. The first flight of Blue Origin’s orbital launch vehicle is years away. The patent dispute is still unresolved, but SpaceX is pressing ahead with the planned precision landing at sea. Four carbon fiber and aluminum honeycomb landing legs are mounted at the base of the 12-foot-diameter Falcon 9 first stage. They will deploy to a span of about 70 feet moments before touchdown. The SpaceX landing pad — dubbed the autonomous spaceport drone ship — is officially named the Marmac 300. It is registered under the ownership of Metairie, La.-based McDonough Marine Service and carries ballast water tanks and repurposed underwater thrusters to hold position in the Atlantic Ocean. The cargo barge was prepared for its rocket landing mission at a Louisiana shipyard, then it moved to a staging point in Jacksonville, Fla. Photos of the vessel docked at the Port of Jacksonville showed technicians preparing the barge for departure to the Falcon 9 rocket’s landing point. Nearby vessels, presumed to be a tug and command ship, also showed signs of rocket-related activity such as the presence of high-tech space communications gear. See photos of the Marmac 300 and support vessels before they departed Jacksonville. According to data from the maritime tracking website marinetraffic.com, the Marmac 300’s tug and its likely control ship went to sea from Jacksonville on Tuesday. McDonough Marine Service’s website says the Marmac 300 is 300 feet long and 100 feet wide — the size of a football field. Musk tweeted last month the Falcon 9 landing barge has extendable wings to expand the width to 170 feet. 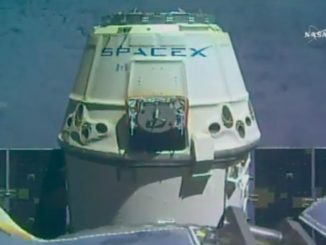 The Marmac 300 is emblazoned with a SpaceX logo in the center of a bullseye painted on a black deck. For Friday’s launch and landing experiment, SpaceX engineers added fins near the top of the Falcon 9’s first stage to add stability as the rocket falls back to Earth. The hypersonic grid fins are arranged in an “X-wing” configuration around the circumference of the launcher and remain stowed during liftoff before popping open on reentry. “Each fin moves independently for roll, pitch and yaw, and combined with the engine gimbaling, will allow for precision landing — first on the autonomous spaceport drone ship, and eventually on land,” SpaceX said in its online update Tuesday. If SpaceX returns the rocket to Earth intact, engineers will examine the booster’s structure, propellant tanks and engines to determine what work is needed to refurbish the first stage and fly it again. 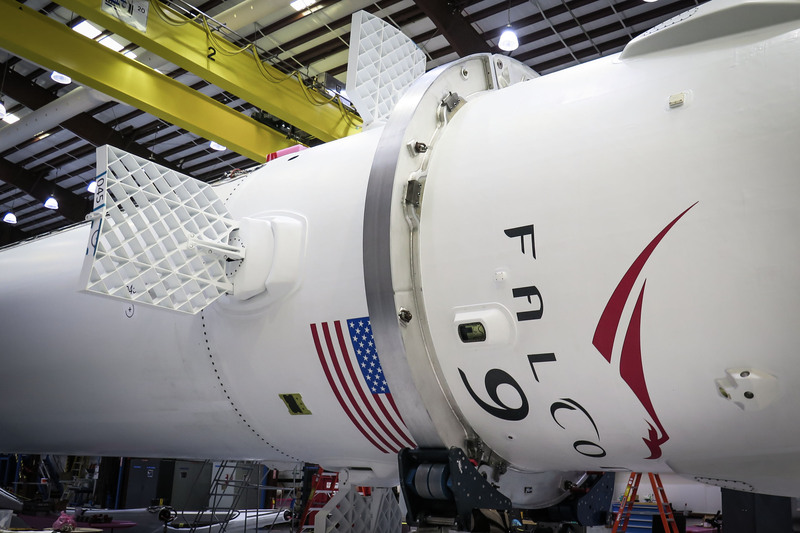 Musk has said SpaceX’s goal is the “rapid and complete” reusability of the Falcon 9’s booster stage. 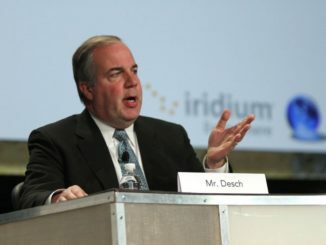 He said the rocket’s upper section, which enters orbit with each mission’s payload, may continue to be a throwaway component of the launcher until a new generation of rockets start flying. But SpaceX’s quest to demonstrate a reusable booster will be restricted to a fraction of the company’s launches in the next few years. 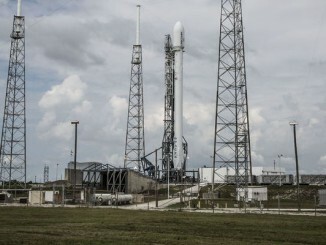 SpaceX officials say some of their flights, such as Falcon 9 launches with heavy commercial communications satellites and military missions, will not have enough leftover fuel to devote to a guided descent of the rocket. When the company’s Falcon Heavy rocket starts flying — a maiden launch is planned as soon as late next year — more launches will have fuel to spare to get rocket stages back on the ground. A launch is often one of the most expensive parts of a space mission for human crews, commercial and military satellites, and scientific probes. Saving the rocket booster and launching it repeatedly could dramatically cut the cost of spaceflight, according to SpaceX. “The reason why there’s low demand for spaceflight is because it’s ridiculously expensive, and so at some point someone has to say, ‘We’re going to make something that’s much more affordable and then see what applications develop.’ That’s what has to happen,” Musk said.